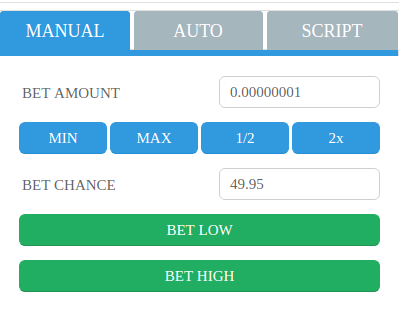 MyDiceBot is a cross-platform automated dicing bot for cryptocurrency dice-sites. Similar to the bot pioneer Seuntjies DiceBot. Multiple platforms are supported, including Windows, Mac, Linux, and Web. Multiple programming languages are supported such as Lua. * You can control every bet by yourself. * Essential configurations are provided for betting automatically. Special thanks to the open source project of Seuntjies DiceBot. 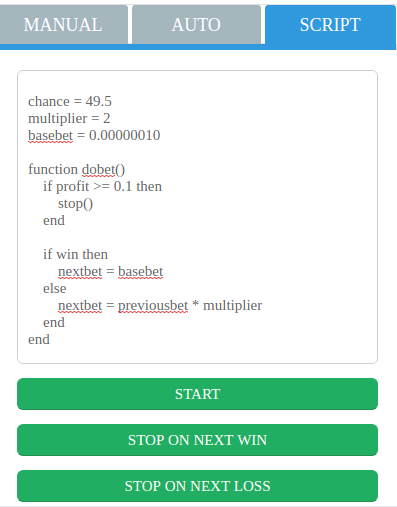 If you need simulation functions or advanced-autobet functions, we recommand Seuntjies DiceBot. "Gambling is gambling no matter what you do or how good your strategy is. The house always wins if you keep playing. Winners know when to stop." "Like any human, we make mistakes, and like any program, the bot is bound to have a few bugs. Use the bot at your own risk. " This is still gambling. The bot is not guaranteed to win. Please do not gamble more than you can afford to lose. The bot has a lot of settings, and we cannot test each and every combination. 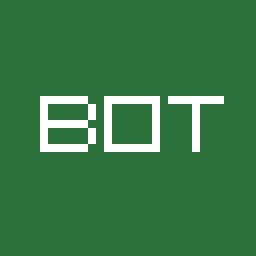 The bot might behave unpredictable and unreliably with certain combinations of settings. Certain actions from the server might also result in unexpected behaviour. We cannot be held responsible for any losses incurred while using the bot. It is your obligation to ensure compliance with any legislation relevant to your country of domicile regarding online gambling. Thanks a lot for supporting. Any feedback or finding issue is welcome. Will try this soon enough. Thanks for your effort to make dicebot! Thanks buddy. Your feedback is the best reward for me. very nice for your effort; now it shows that you learned programming not for nothing! make your bright ideas become true - you are the best! i respect people with ideas and hard work to achievement! many promising dice alternatives, including this one. for me it's better at Primedice because it still provides convenience in an attractive appearance. the profit and loss depends on each person. best wishes to you and your journey with primedice. Yep, totally agree Seuntjies is the best one. We just provide an alternative one for the guys who only has MacOS or Linux OS, as Seuntjies only runs on Windows at this moment. Thanks buddy for your support. MyDiceBot - v3.0.0 | 09.Nov.2018 | Bitsler is added with 18 Currencies! is this ok for the site? Please read the initial posts of a topic completely. This is the second time you haven't done that. We are looking at api.primedice.com/graphql at this moment, hope we can handle it properly asap. This script doubles the bet after a loss but starts at a very high chance of success: 95%. After each bet the chance reduces enough to bring equilibrium to profit but stops reducing chance at 49.5%. First loss goes from 95% to 67%, then 57% and then gradually lower and closer to 49.5%. It basically buys you a few more higher probability roles before the same old 49.5% martingale. -- You could just use Sleep(n) to use LUAs built in sleep function. -- But this one will have the same result without killing your CPU. lossstreakcount = 0 -- sample: user-defined lossstreakcount. -- some sites limit bet latency due to the low bet amount. 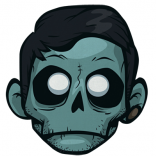 -- enable it and avoid to be banned, just in case. -- adjust the stopping condition of session profit. -- adjust the stopping condition of wins. 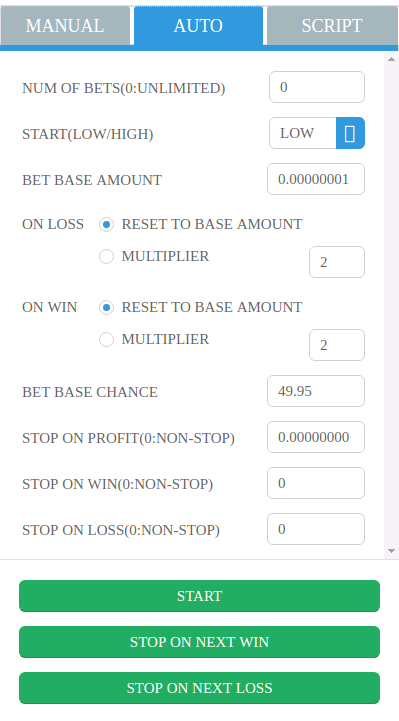 -- adjust the stopping condition of bets. -- adjust the stopping condition of loss streak. -- if win, reset bet to base amount. -- then 57% and then gradually lower and closer to 49.5%. Yooo I was looking for a dicebot that supports mac for ages. Thank you man! v4.0.1 is released and fix Primedice login issue. MyDiceBot - v5.0.0 is released and Stake.com is supported. I normally wouldnt trust anything but Seuntjies bot, but given you have it for OSX and thats all I use, I will give it a try. Hope its done well, I'll definitely let you knwo what I think about it once I've had achance to try it out. Any issue or feedback is welcome to report. I cleaned up your original post, using correct formatting and such. Good luck with your project, I haven't yet had a chance to look through your source code to critique your project, but will do so in the future. In future, don't forget to use code tags and bullet points if you can.